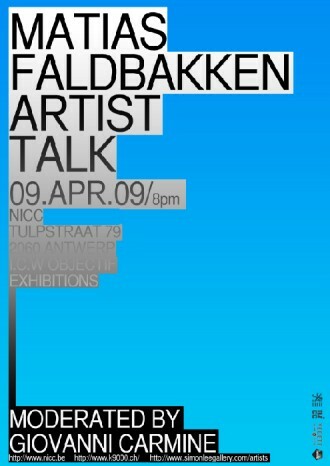 On April 9 (8pm), Objectif Exhibitions and NICC will organise an artist talk with Matias Faldbakken, who will be interviewed by Giovanni Carmine (director Kunsthalle St.Gallen) at NICC (Antwerp). 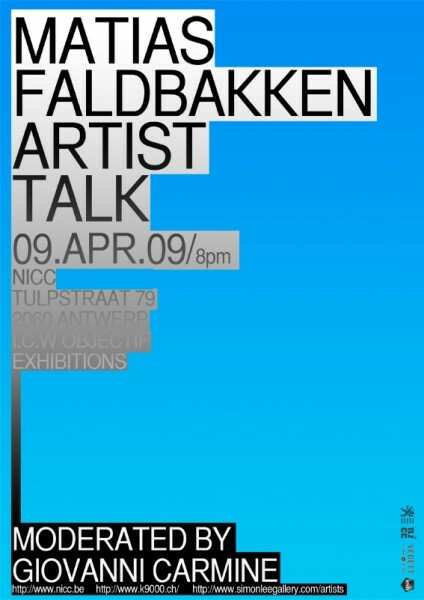 Objectif Exhibitions presents Norwegian artist and writer Matias Faldbakken's first show in Belgium. Faldbakken (b. 1973, lives and works in Oslo) mixes a conceptual strategy with trivial gestures, vandalism and appropriation, poetry and pop-culture, often circling around the idea of artistic production as the practice of doing nothing and of negation. He often employs invisible negatives through which to reconsider more ordinary, familiarly assumed constructions of any given situation. His most recent solo exhibitions include The Hills, STANDARD OSLO (Oslo) in 2010; Shocked Into Abstraction, Ikon Gallery (Birmingham), The National Museum of Art, Design and Architecture (Oslo) and Reena Spaulings Fine Art (New York); Extreme Siesta, Kunst Halle St Gallen (Sankt Gallen) in 2009 and Kunsthalle Friedricianum (Kassel) upcoming 2010. In 2005, he represented Norway in the Nordic Pavillion at the Venice Biennial.